Sometimes a large vector layer needs to be rendered on a relatively small area on the screen. This happens especially with mobile devices, where screen size ranges between 240 x 320 and 480 x 850 pixels. If the vector layer affects a small number of pixels, it makes no sense to go through all the shapes and dedicate some (possibly optimized) computation and graphic instructions to each one. We should prepare an alternative for these cases, which will be used when the scale denominator surpasses a certain value. Using the quadtree approach, we can create before-hand a drawable spatial index that will quickly tell us which pixels must be painted, and hopefully which color should be used. A non-optimized, initial attempt to do this is explained here. At the lowest level of the spatial index, we’ll have lists of integers telling us which features are intersected by each sub-square. If (v < 0): This value indicates that the feature with index -(v+1) in the shapefile completely contains this sub-square. Therefore, this sub-square must be painted with the fill color that corresponds to feature with index -(v+1). If (v = 0): This value indicates that this sub-square in completely outside any feature in the shapefile. Therefore, this sub-square must not be painted. If (v > 0 and v < 1,000,000): This value indicates this sub-square intersects with at least one feature but is not contained by any feature, and its four sub-squares are described in the row with index (v-1). Therefore, in case we have to paint this sub-square, we’ll use the layer’s border color. This will happen with views where the scale denominator is very large, and the spatial index itself is enough to draw the layer because the width of each screen pixel in map units is larger than the width in map units of the deepest sub-squares in the spatial index quadtree scheme. If (v >= 1,000,000): This value will only be found in the lowest level of the quadtree scheme, and indicates that this sub-square is not contained by any feature in the shapefile, but intersects a number of features, and the indices of those intersected features are listed in the array, starting in position (v mod 1,000,000) and the number of features intersected is (v div 1,000,000). If the value is 0, the sub-square is ignored. If the value is negative (sub-square is contained by a feature), we’ll find out the fill color that corresponds to that feature and paint it. 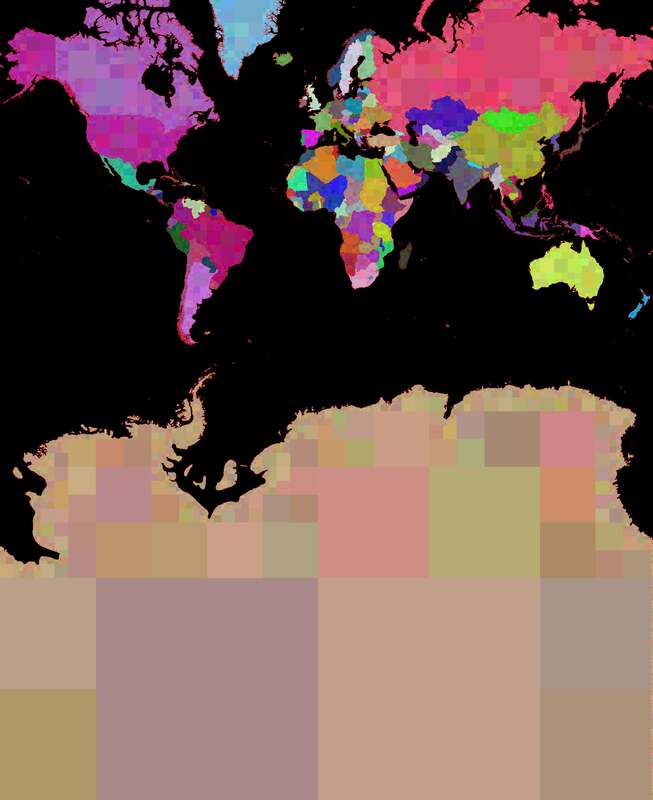 This may result in a single pixel or a square on the map (see image). If we need to go deeper because the screen pixel width is smaller than the sub-square’s width, then we’ll recursively visit the row indicated by that value. If we need to go deeper but the spatial index does not have more levels, we’ll find a number bigger than 1,000,000, and we’ll have to access the SHP file to get those features, and paint them in the traditional way. If the sub-square’s width is by now smaller than the screen pixel width and the value is indicating a row where the sub-square is described, then we are in the case where the spatial index is enough to paint the layer, and we’ll use the border color to paint this sub-square (which will result in a single pixel). In this case, we cannot use a different color for the border of each feature. By indicating in a quadtree scheme the index of the feature that contains a certain sub-square or the place where that sub-square is expanded, we can draw the layer very quickly when all the shapes need to be painted in a small portion of the screen. At the bottom of our quadtree spatial index, we can list the indices of the features intersected by each leaf sub-square.